The SAEC WE-308 is designed to offer the new reference standard of tone arm engineering for the serious audiophile. The Audio Engineering's remarkable approach toward the perfection of disc sound is crystallized in the WE-308's unique construction, the Double Knife Edge. This newer construction covers up disadvantages of conventional knife edge type tone arms. 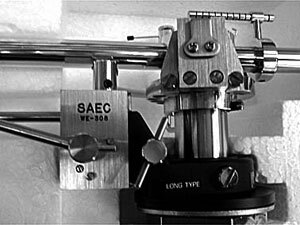 The Double Knife Edge provides the lowest friction level and highest sensitive movement of the tone arm ever achieved. Therefore, the WE-308 with any advanced cartridge tracks the record groove with less distortion than ever and reproduces clear directionality, pinpoint placement of instruments and phenomenal cleanness of the disc sound. SAEC WE-308 / WE308 owners manual, service manuals and schematics are for reference only and the Vinyl Engine bears no responsibility for errors or other inaccuracies. The PDF files are provided under strict licence. Reproduction without prior permission or for financial gain is strictly prohibited. This website is not affiliated with or sponsored by SAEC. Posted Tue, 07/05/2011 - 11:27 by ogasawara. I bought a Saec WE 308(used) 3 months ago, but today I read the Saec WE 308 manual for the first time. I was looking for the manual. And today I got it. I wanted to get some informatioins from the manual. I was so glad to get it. Posted Fri, 12/26/2008 - 13:44 by FilipeLemos. I bougth my turntable Kenwood KD 600 with a Saec WE 308(used) almost 30 years, only today I read the Saec WE 308 manual.